In the male dominated world of video game development, Carol Shaw stands out not only as a woman in technology role model, but as an innovative designer. She began her career with Atari in 1978, but according to PC Magazine she may be the first female video game developer, ever. Throughout her life, Shaw was often the only female perusing her chosen interest. Her parents encouraged her to excel in math and computer science. In college, at UC Berkley, Shaw studied engineering. As she finished her coursework for a Masters in Computer Science, Shaw interviewed with Atari. She was in a work-study program at the time, but Atari hired her because of her programing knowledge. Author Chris Suellentrop of the New York Times states that the first commercially released video game designed by a woman was Carol Shaw’s Tic-Tac-Toe. In the late 1970s and early ’80s, one person created the entire game. Shaw not only did the programming but also created the sound and graphics. In 2011 Benj Edwards of Vintage Computing and Gaming conducted a very interesting interview with Shaw. She noted that since she was used to being the only woman in math and science, she was comfortable working with men only. In general, Shaw didn’t care what people thought of her interests or her career. She credits the heightened awareness of feminism in the 1970s, which helped her to understand that she could do what she wanted. Shaw worked for Atari for two years then the industry took a dip. She was an assembly language programmer at Tandem for 16 months and then Activision recruited her. The first game she created for that company was the popular River Raid, for the Atari 2600. In the early 1980s, “shooting” games took place on one screen but Shaw developed a scrolling format. River Raid won several awards including Infoworld’s best action game and best Atari 8-bit game of the year. Margaret Hamilton. You may not recognize the name, but, if not for her legendary programming skills, Neil Armstrong’s famous ‘One Small Step’ speech not only may have been delivered by someone else — but quite probably in Russian. Hamilton and her team of programmers at MIT wrote one of the most important pieces of software ever written, and in doing so changed the world for all mankind, men and women alike. The Apollo 11 mission that first put man on the moon on July 10, 1969 was made possible by guidance software written by Hamilton’s team. They wrote the code that allowed the Apollo Guidance Computer units in the mission’s command module and lunar landing module to successfully navigate to the moon, land, and return to earth. Under Hamilton’s leadership, the team not only wrote code that worked, but code that save the mission from almost certain failure. NASA was aware of problems between the Apollo Guidance Computer and the on-board radar on the lander. The radar, which was largely useless during the landing sequence, would nonetheless flood the guidance computer with an overwhelming storm of unnecessary data that could easily overwhelm and shut down guidance during the most crucial part of the landing sequence. The coding team was aware of this, and wrote the guidance program in such a way that the guidance computer could be quickly restarted and the code reloaded mid-landing sequence. Their foresight made the Apollo 11 landing possible when, as expected, the guidance computer faulted and had to be restarted during the landing. NASA recognized Hamilton for her contributions to the Apollo program by awarding her the Exceptional Space Act Award in 2003. A graduate of MIT, Radia Perlman’s first major contribution to tech was to create a toddler-oriented version of the LOGO programming language, which she called TORTIS. After graduating with a Ph.D in Computer Science in 1988, she moved on to work for Digital Equipment Corporation, then one of the world’s largest computer hardware vendors. It was during her time there that she would write an algorithm that modern networks still lean on: Spanning Tree Protocol (STP). STP is one of the cornerstones of Ethernet networks and is critical in bridging operations. While it’s stretching a bit far to say that she invented the Internet, it’s also true that the modern Internet (not to mention local area networks) would not exist as we know it without her work. STP prevents networks from creating bridging loops, which can eventually create a “broadcast storm” that can bring the entire network to a halt in seconds. While Radia will likely never be a household name with the general public, the legacy of her work is found in every device that uses the Ethernet protocol. Members of the tech community who know their history recognize her contributions, however, with a number of them dubbing her “The Mother of the Internet.” She humbly rejects that title, telling The Atlantic in a 2014 interview that no one person should lay claim to having invented the Internet. Radia continues to work in the field, most recently as a fellow for the Institute of Electrical and Electronics Engineers. She also continues to speak out about the need for greater diversity in the tech industry, and the stereotypes that women are still struggling to overcome to consistently gain stature and recognition equal to that of their male peers. Grace Hopper is the most badass woman in tech that you haven’t heard of. She was one of the world’s first computer scientists, helped the U.S. win World War II, revolutionized programming languages, and is rumored to have coined a term that everyone still uses today — computer bug. Grace earned her PhD in Math from Yale University in 1934. When WWII started, she joined the U.S. Navy and was assigned to the programming team for the Mark I, one of the world’s earliest computers. This computer was used for many military calculations, most notably The Manhattan Project. After the war Grace continued her work in computing. She invented the first compiler in 1952, but it took two years for people to actually believe that it worked. It’s hard to imagine computers today without compilers, and the structure of programming languages today is largely due to her efforts in this area. Grace Hopper is also often credited with finding the first “computer bug,” an actual moth that got into the Mark II computer and caused an error. It’s not clear whether she coined the term or just found an actual bug that was causing a “bug,” but it’s an amusing anecdote to remember the leading lady of computers. 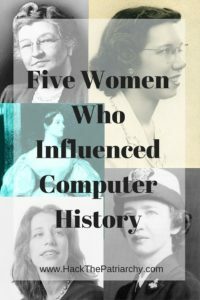 Women have played an important role in the world of computers from the beginning. Many people call Ada Lovelace “the first programmer,” but “the first computer scientist” would be more accurate. Charles Babbage never completed his Analytical Engine, and it wasn’t possible to write actual code for it, but Lovelace demonstrated in detail how to turn an algorithm into a computer program. Even more important, she saw broad possibilities in “the science of operations,” recognizing it could be applied to any subject. It would be a century before technology could catch up to her ideas. Edith Clarke also did her most important work before the computer era, but her work in electrical engineering prefigured computers. In 1919 she became the first woman to get a degree in electrical engineering from MIT. At General Electric she devised a graphical calculator that solved problems of current, voltage, and impedance in power lines. Before the electronic devices, “computers” meant people (usually women) whose work consisted of calculations, and she trained and directed a team at AT&T. Frances “Betty” Holberton worked as a “computer” during World War II, performing ballistics calculations, and then became a member of the ENIAC programming team, the first people to program an electronic computer. Programming the ENIAC wasn’t a matter of writing code in a language, but more one of reverse-engineering the machine. She later participated in the development of the UNIVAC computer and the creation of the COBOL programming language. When we talk about COBOL, we immediately think of Admiral Grace Hopper, whose great achievement might be summarized as relating computers to common sense. She headed the team that devised FLOW-MATIC, the first business-oriented programming language, at Remington Rand. She followed this up with COBOL, which for many years was the dominant computer language for business applications. Her work on these languages demonstrated that non-mathematicians could write computer code.